Come and meet other farmers and ranchers and talk about local agricultural issues. We will have a farm labor expert, Bryan Little from Farm Employers Labor Service to answer your questions about hiring, managing, and following labor laws for farm workers. Thinking about starting a farm or ranch in Placer or Nevada County and wondering where to start? Come and learn about available resources and assistance, things to consider in getting started, and get started planning your dream farm. UC Cooperative Extension Farm Advisors Cindy Fake and Dan Macon lead the class. Pre-Registration is required. Cost is $10 per person. Register at http://ucanr.edu/survey/survey.cfm?surveynumber=26796. Space is limited, so sign up early. This is a 2-day intensive introduction to starting a small commercial farm or ranch. If you are starting a small ag operation in the foothills, you should attend the Academy. Learn about assessing your resources and choosing products, the basics of market-driven farming, and economic tools. You will finish with an action plan for jump-starting your operation. This seminar focuses on marketing, business, and economic planning for profitable small farms, not production. Local expert farmers and ranchers and UCCE Farm Advisors will help you refine your plans for your farm or ranch. The class is limited to 15 prospective producers. Apply at http://ucanr.edu/survey/survey.cfm?surveynumber=26798 We will review applications in March and notify you of your status. ● Be able to lift 50lbs and work comfortably with their body. Farming is a very physically demanding job and often requires continuous lifting, squatting, bending and carrying in challenging weather conditions (heat and cold). ● Manage sales and monetary transactions. ● Valid drivers license. Experience driving a cargo van and manual car preferred but not required. ● Not required, but preferred--an interest in working cooperatively. We are a worker-owned and operated farm and we would like to hire employees with the hope that they will become candidates for membership/partnership at Flying V Farm. ● Flying V Farm Membership consideration after one year of work. Please e-mail a resume with two references in addition to a brief statement about your interest in agriculture and Flying V Farm to info@flyingvfarmca.com. Meet produce buyers around the region and build new sales relationships with local grocers, produce distributors, restaurants and more at the Sacramento Meet the Buyers Tour! Get a head start on next season by establishing new relationships directly with buyers who care about sourcing locally and prepare for next season's plantings based on local market needs. Bus departs at 7 a.m. and returns at 5:30 p.m.
311 Nicholas C Shouten Ln, Chico, CA 95928. Bus departs at 8:45 a.m. and returns at 4 p.m.
70 Cottonwood Street Woodland, CA 95695. 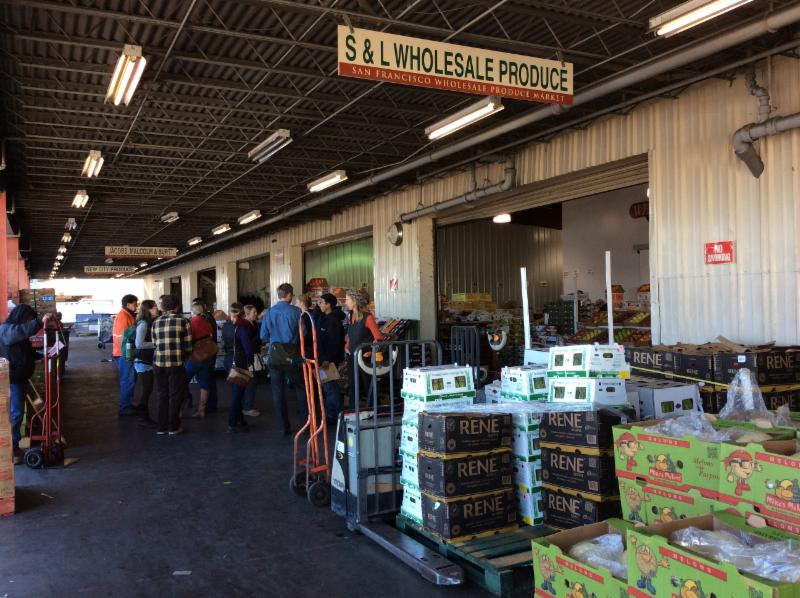 Hop on a bus to tour Sacramento wholesale produce buyers to see their facilities and hear about their ordering and packing procedures. To register, click on one of the registration links above or contact Li Schmidt, UC Sustainable Agriculture Research and Education Program, at lnschmidt@ucdavis.edu or (530) 752-7541. Join us for a delicious, home-made breakfast at the Happy Apple Kitchen and get to know other farmers and ranchers in our area. Enjoy a chance to relax and talk with other producers about farming and ranching issues. We will be talking about planning for operational continuity of your farm/ranch when illness, injury, death, or natural disasters happen. Buffet breakfast. Cost is $15 per person, and reservations are required. Make your reservation at http://ucanr.edu/survey/survey.cfm?surveynumber=26562 by noon on February 8, 2019. Capay Mills, Yolo County’s premier (OK, only) registered, vertically integrated artisan flour mill, is looking for a part-time mill associate. We need someone who can commit to a minimum of 8 hours per week, starting ASAP, with the possibility of additional hours as orders grow (as they have been). Our shop is in beautiful downtown Esparto, 25 miles (35 minutes) from Davis. Capay Mills produces unique stone-ground flours from locally grown grain (mainly heirloom varieties), for exceptional bakeries, restaurants and retail customers in the San Francisco Bay Area and Sacramento. We mill grain we grow ourselves, as well as by partner growers in Capay Valley and northern California. We are on track to increase our capacity significantly in the coming year. The ideal candidate is interested in helping build a sustainable local grain economy, and ideally has experience or interest in artisan baking, bread-making, brewing, distilling or other grain-driven endeavors. You must be capable of lifting 60#, and can tolerate working in a dusty and fairly loud environment (breathing and hearing protection is provided). We offer the opportunity to engage as deeply as you’re interested in the local grain movement, from growing to milling to marketing. Work days and schedule are flexible, though our normal production days are Tuesdays through Thursdays. In addition to milling production work, we are also looking for a market associate to represent Capay Mills at one or more of our farmers’ markets per month on Saturdays (Ferry Plaza, San Francisco, or Davis Farmers’ Market) and Sundays (Temescal Farmers’ Market, Oakland). Contact me at info@capaymills.com, putting “mill associate” in the subject line, and let me know what interests you about the position. Check us out on Instagram (capay_mills), FB (@capaymills) and Twitter.